We’re always looking for the brightest and best people. Our apprenticeship opportunities will make you one of the people who can help end heartbreak forever. Our apprenticeship opportunities are a genuine job, with training, an opportunity to earn while you learn and gain the necessary skills and professional competencies in your chosen career. All apprenticeships include elements of on the job and off the job training leading to industry recognised standards or qualifications. All qualifications are predominantly work-based with no need to go to college. You’ll be supported by external providers and assessors who are experts in this field and will validate your training. One of the things that makes a career in the retail sector so rewarding is the array of roles it offers; from operations and customer service to warehousing, business administration and leadership positions. Our Apprenticeship programme is the perfect way to dip your toe in the world of retail and find the role that suits you. You’ll be part of a structured programme and be supported every step of the way. 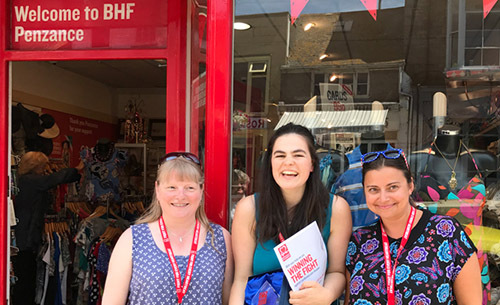 So if being part of a world class retail operation that helps fund millions in groundbreaking research gets you excited, a BHF apprenticeship could be for you. Everyone is so supportive and I have learned a great amount since I started volunteering and gained some invaluable experience. For me, it has led to me being offered a full time Retail Apprenticeship so now I get to do a job I love and continue my education.